Indian Railway is a member country of “International Union of Railways” (UIC) which is celebrating 3rd June’ 2014 as “International Level Crossing Awareness Day”. Hence South Eastern Railway has observed “Level Crossing Awareness Week” from 2nd to 6th June’ 2014 and "International Level Crossing Awareness Day” on 3rd June’ 2014. The motto for this year is “Life is more precious than time. Stop, Look-out for trains before crossing Unmanned Level Crossings”. 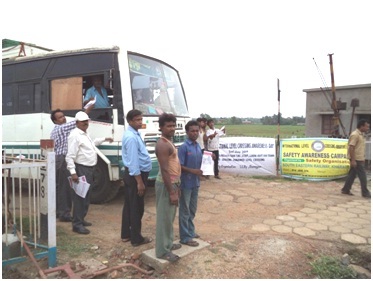 As Level Crossing accidents are of 40% of total accidents in Indian Railways with 66% fatalities, Safety Organization of South Eastern Railway has organized several Safety Awareness Camps to educate road users about the Rules and Safety measures needs to be taken before crossing a unmanned level crossing . 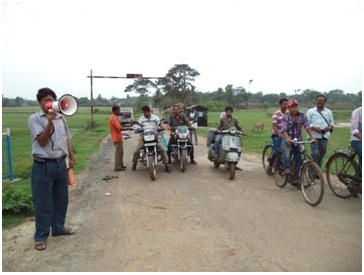 Safety Counselor counsels public at unmanned level crossing. Raiders is being counsel regarding safety measure to be taken before crossing a unmanned LC. 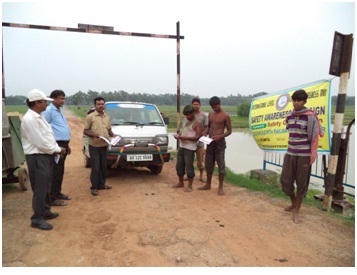 Counseling the public transport driver & conductor regarding safe passage at level crossing. 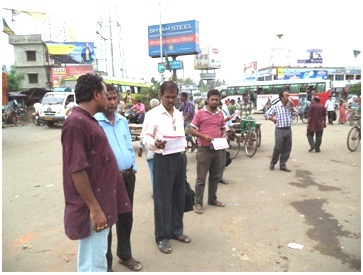 Public campaign & distribution of Safety pamphlet by Safety team.